Belarusian President Aleksandr Lukashenko has ordered to step up security and “turn everything inside out” to find those responsible for the Minsk Metro blast that killed 12 and injured over 150. 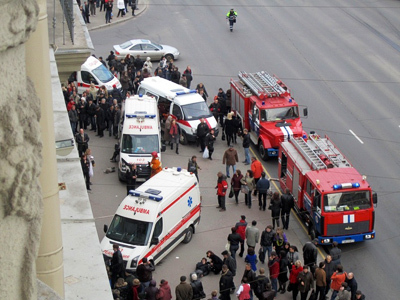 Speaking at an emergency meeting several hours after the deadly explosion on Monday evening, Lukashenko said that the blast is a serious challenge to the nation that requires “an adequate response”. “I have warned you that we would not be left in peace,” he said, though not clarifying what exactly he hinted at. The Belarusian leader urged the law enforcement and security agencies to work night and day to find the masterminds of the bombing. “All the units should be on alert. Turn everything inside out. Especially what concerns unregistered weapons, explosives and ammunition,” the president demanded, cites Belarusian agency BelTA. He added that he expects the investigation team – led by Deputy Prosecutor General Andrey Shved – to come up with results daily. 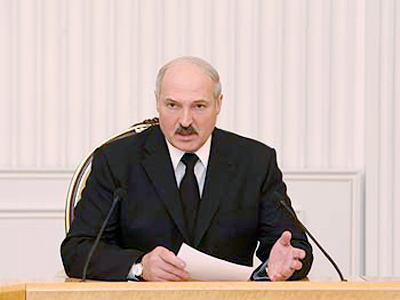 Lukashenko did not rule out that the explosion could be connected to the attack on July 3, 2008, at the Independence Day celebrations in Minsk which injured over 40 people. “These might be links of the same chain,” he said. The president ordered the KGB chair, Vadim Saitsev, to analyze the situation and establish those who could benefit from undermining “calm and stability in the country”. "I don't exclude that this gift could have been brought to us by outsiders. But we have to look at ourselves as well," said Lukashenko. The president also called on the nation to help find the organizers of the bombing. “It will be difficult to find these monsters without your help,” he said. 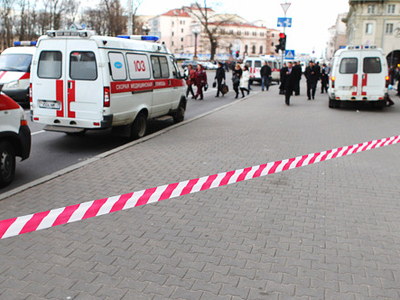 According to the Belarusian Interior Ministry, two suspects are now being searched for based on information provided by the witnesses. "Identikits of these two people have been made based on information received from citizens," Interior Minister Anatoly Kuleshov said at a press briefing, cited Interfax. Aleksandr Lukashenko arrived at the Oktyabrskaya metro station with his younger son Nikolai shortly after the bomb went off at about 5.55pm.He was the first one to lay flowers at the scene of the deadly accident. 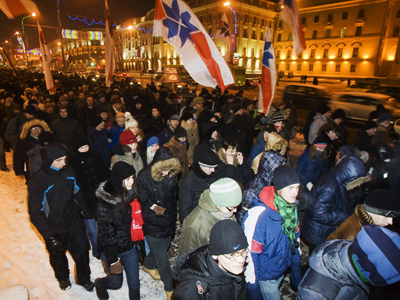 April 13 has been declared a Day of Mourning in Belarus. Several foreign states – including Russia, the UK, and Israel – have offered their help in investigating Monday’s attack in the Belarusian capital. On Tuesday, two experts from the Russian Federal Security Service arrived in Minsk. A team of six Russian doctors – including resuscitation specialists, neurosurgeons and traumatologists are also in the Belarusian capital. They will provide consultative assistance to their Belarusian counterparts and, also, examine Russian citizens injured by the blast. Russian President Dmitry Medvedev called his Belarusian counterpart several hours after the explosion to express his condolences over the tragic events and, also stressed “readiness to render all necessary aid and assistance” to the former Soviet republic. Whoever is behind the terrorist attack and whatever goals they pursue, “it is a grave crime that resulted in death of innocent people”, Medvedev said, according to the Kremlin press service. 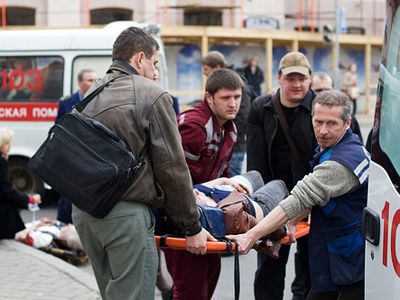 Prime Minister Vladimir Putin also expressed his “most sincere condolences” over the deadly blast. In a wire sent to his Belarusian counterpart Mikhail Myasnikovich, the Russian premier assured that Minsk “can count on any assistance from us, including in the investigation of the incident”, adding that Russia knows what such tragedies mean from first-hand experience. While the majority of analysts, politicians and ordinary citizens are pretty sure that the main purpose of the blast was to stir up the situation in Belarus, it is still not clear who exactly could be behind the attack. There are worries among Belarusians that the events may provoke a further crackdown on Lukashenko opponents. Aleksandr Milinkevich, the leader of the movement “For Freedom”, said that forces both in the country and abroad would gain from destabilizing the situation as it would serve as a pretext for “harsher political repressions” and, as a result, destroy the republic’s chances for European integration as well as weaken Belarus’ independence. “Terrorism is not part of our history and tradition,” he added, as cited by the Belarusian Partisan opposition news website. Former presidential candidate Grigory Kostusev of the Belarusian People's Front has also voiced fear that the opposition may be made a scapegoat for the deadly incident. The politician believes that terrorists could have entered Belarus from Russia and suggested that tougher border control should be introduced between the two states. “The border cannot be as open [as it is now]. Definitely, the trouble has come from the place where such problems occur regularly,” he told Interfax agency. The leader of the Russian Liberal Democratic Party (LDPR), Vladimir Zhirinovsky – who is known for his extreme statements – has also suggested possible theories for the attack.According to one of them, the West could be behind the Minsk blast. The politician says the incident could be used to divert media attention from the events in North Africa, namely the NATO operation in Libya. A second possible cause of the explosion is Russia’s efficient work in countering terrorism on its territory. “Perhaps… the Russian anti-terrorist center has ruined too many planned terrorist scenarios in our country [Russia]. That urged terrorists to carry out an attack in Minsk,” Zhirinovsky told journalists on Tuesday, cites RIA Novosti. He conjectured that terrorists may have their “plan of work” to justify money they get from their sponsors. “They have fulfilled their plan for the first quarter – committed a terrorist attack in [Moscow Domodedovo Airport],” he said. And after further attempts failed, they picked Minsk as a spot for yet another attack. 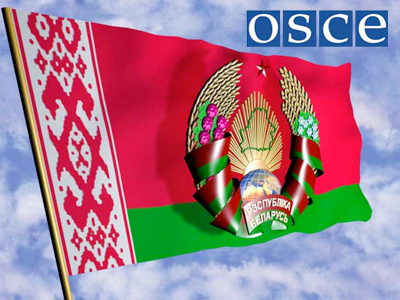 According to the third version suggested to Zhirinovsky, Belarus could become a “nest” for terrorist organizations from Afghanistan, Caucasus or Kosovo. The evaluation of the Minsk incident given by the Russian Communists leader, Gennady Zyuganov was a bit more careful. He believes that the first-ever attack on the Minsk Metro could be masterminded by some powerful forces who are interested in destabilizing the situation. Zyuganov told Interfax the organizers aimed at “undermining the healthy climate of Belarus and creating an atmosphere of fear”. Zyuganov noted that Belarus is one of the very few post-Soviet republics that keep continuously developing while going on its own path. There is no organized crime, oligarchy and dissipation that are common for other regions, but, at the same time, living standards are pretty high. According to the Communist leader, Belarus ignoring any outside pressure makes “aggressive forces” have “heartburn”. He stated that Europe aims to break Belarus down.